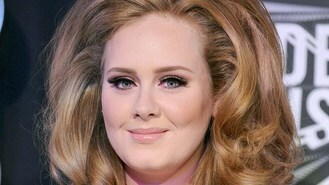 Adele has made it into the top ten of Billboard's Money Makers list. The Grammy-winning British star cancelled most of her US tour due to issues with her vocal cords but her album 21 sold more than five million copies in 2011, helping the 23-year-old singer-songwriter enter the list at number ten. Including sales from this year, 21 has sold nearly eight million copies. Taylor Swift was named Billboard's number one money maker of 2011. The 22-year-old country star reportedly earned more than 35 million dollars in 2011, beating U2 to the top spot, with the Irish rock superstars earning 32 million dollars. Kenny Chesney, Lady Gaga and Lil Wayne rounded out the top five. Artists' rankings were based on US income sources from tours, albums sales and publishing royalties. Billboard said in a press release that it didn't factor in "sponsorships, merchandise sales or synchronisation deals". Singer Jessie J has revealed her spinning chair broke down during auditions for BBC One's new music talent show The Voice. Sir Tom Jones has taken a swipe at The X Factor's Simon Cowell, saying he is not in a position to judge talent when he has never sung live on stage himself. Gotye has notched up a fourth week at the top of the charts with his smash hit Somebody That I Used To Know, which has now seen UK sales top half a million. Bee Gees star Robin Gibb believes his battle with cancer and the death of two of his brothers could be a form of payback for the global fame and fortune his family has enjoyed. Children's TV host Justin Fletcher - known to millions of youngsters and parents as CBeebies' Mr Tumble - is set to be a chart star. James T Ellis, who belted out the refrain Burn, baby burn! in a 1970s-era disco hit that is still replayed in modern sports arenas, has died. He was 74.